Being able to change its lenses makes the dSLR one of the more versatile camera systems available. You can customize the camera by putting on (mounting) the lens that works best for your subject. Focal length: Skipping many technical caveats, focal length is basically the distance between the lens and the sensor in the camera body when the subject is in focus. The focal length and sensor size determines the lens’ field of view. Wide-angle lenses have shorter focal lengths and larger fields of view, while telephoto lenses have longer focal lengths and smaller fields of view. The focal length, or focal length range, will almost always be part of the lens’ name. Maximum aperture: The largest aperture setting the lens can be set to. Larger apertures let in more light. 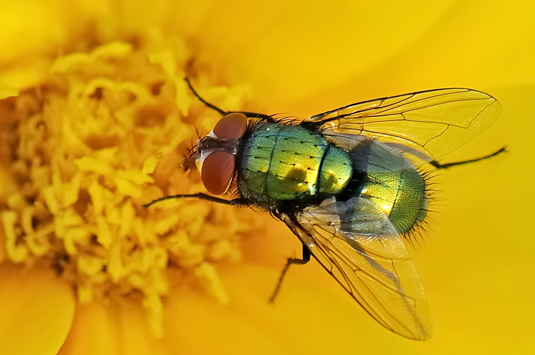 Lenses with large maximum apertures are considered fast. Less expensive lenses have a smaller maximum aperture than professional models. The maximum aperture is normally part of the lens’ name. Minimum aperture: The smallest aperture setting the lens can be set to. This affects how well the lens works in bright light, and is a factor when shooting close-ups. Minimum apertures are normally hidden in the specifications. Lens mount: The designation of the mount used to attach the lens to the camera body. Nikon uses the Nikon F mount. Canon uses the EF mount. Sony uses the Alpha mount on its dSLRs and dSLTs. None are interchangeable. In other words, you can’t fit a Nikon F-mount lens on a Canon EF mount camera. Nikon DX and Canon EF-S lenses are designed to work with cropped-frame cameras. Nikon FX lenses and Canon EF lenses can be mounted on both full-frame and cropped-frame cameras. The dominant characteristic of any lens is the focal length. What follows are the three basic divisions. Many zoom lenses can take photos in all three regions. Wide-angle: These lenses have a focal length less than the diagonal size of the camera sensor. For cropped-frame cameras, this is roughly anything less than 24mm. For full-frame lenses, 35mm and under is considered wide angle territory. Wide-angle lenses specialize in taking landscapes and cityscape photos where the subjects are large and often far away. 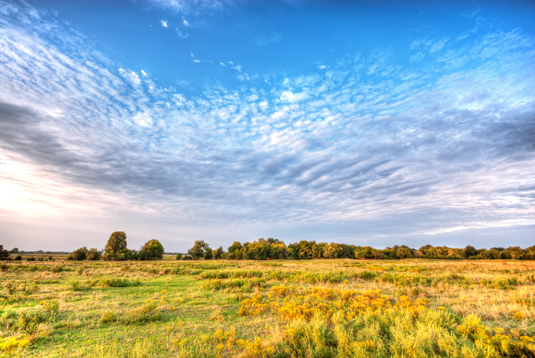 This following shot, taken in Oklahoma, shows the scenery and clouds at sunset. You need a wide-angle lens to capture scenes like this effectively. Wide-angle lenses also excel at taking photos of large and small interior spaces. Normal: Normal lenses have a focal length roughly the same diagonal size as the camera sensor. On cropped-frame cameras, anything in the range of 26-35mm is considered normal. For full-frame cameras, the normal focal lengths range from 40-60mm. 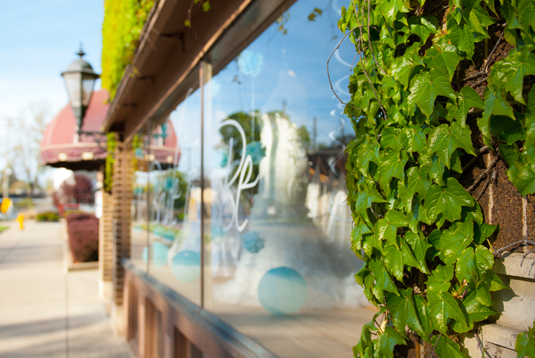 The following shot of a bridal shop shows the perspective you get from using normal focal lengths. It looks like you’re standing there. These photos are very natural and are a hallmark of casual and street photography. Telephoto: Telephoto lenses have focal lengths greater than the diagonal size of the camera sensor. On a cropped-frame camera, any lens with a focal length over 35mm has telephoto capability, while 60mm is the threshold of telephoto on full-frame cameras. 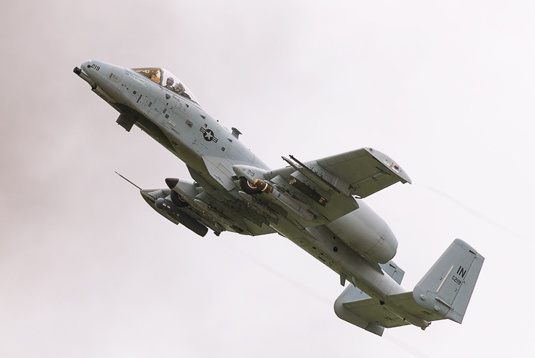 The next photo of an A-10 Warthog at an air show was captured using a 300mm telephoto lens on a cropped-frame camera body, resulting in an effective focal length of 450mm. Prime: These lenses have a fixed focal length and cannot be zoomed in or out. This specialization generally produces higher quality photos than those taken with a zoom lens. You’ll find prime lenses in all focal length categories: wide-angle, normal, and telephoto. Wide-angle zoom: These lenses zoom in and out but keep their focal lengths confined to wide-angle territory. General-purpose zoom: Also called standard zoom lenses, these lenses are very versatile. The most popular models cover everything from wide-angle to near telephoto focal lengths. This gives you additional flexibility when framing up your shot. Most kit lenses (the lens sold with the camera body) are general purpose zooms. Generally speaking, everyone should have a decent general purpose zoom lens. Manufacturers often have several to choose from, ranging in size, capability, and price. Telephoto zoom: These lenses work similarly to wide-angle zooms, but with a different area of expertise: telephoto focal lengths. Specialty: Many other types of lenses are out there, ranging from macro (extreme close-ups, as used to capture the fly in the preceding figure), to tilt-shift (changing the orientation of the focal plane), and pinhole (having an extremely small aperture) lenses. 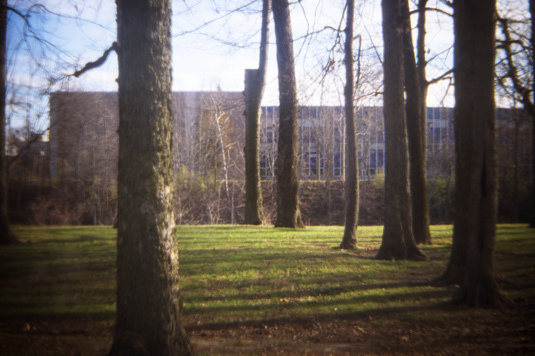 You can buy plastic “toy” Holga or Diana+ lenses (used to take the photo of the trees and building that follows) for your dSLR, or high-quality LensBaby lenses for other creative purposes. Experiment and have fun. You may not realize how much you love really creative lenses until you take the plunge and get one.